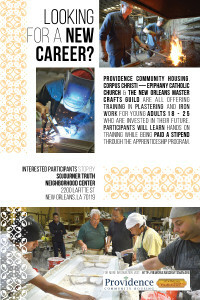 The New Orleans Master Crafts Guild is reviving centuries-old apprenticeship training in the building trades. 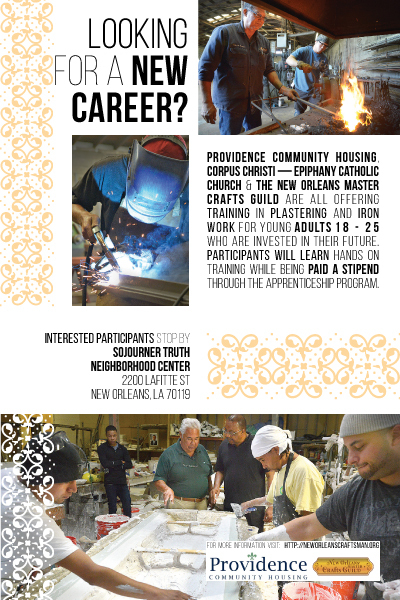 We are training new generations of highly-skilled master craftsmen who will be required to build and maintain the distinct architectural landscape of New Orleans. The training consists of an intensive two to four week classroom training led by practitioners that results in basic construction industry-based certifications. The basic training is followed by apprenticeship placements with a skilled craftsmen based on demonstrated interest and skills. Each participant will work full-time as an apprentice to a local skilled craftsman for at least six months. Program participants who successfully complete the six-month apprenticeship program will have the opportunity to continue for another six months and advance into assistantship positions. Below is an Apprentice Training announcement seeking new applicants. This poster was created by Collection of Collections, a visual communication studio in New Orleans.